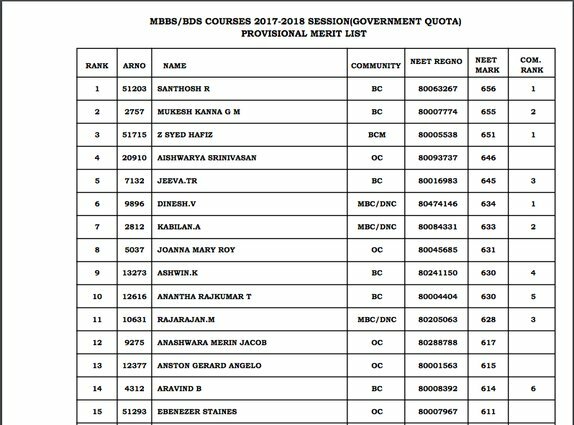 After the Supreme Court order on August 22 that declared Tamil Nadu would not be exempt of NEET, the state has issued the first merit list today on August 23, 2017. After waiting for well over two months since the NEET results were declared, candidates in Tamil Nadu will finally be able to check the state-wide merit list for medical admission. A total of 27,212 candidates have been shortlisted for counselling for the 3,250 government medical seats in the state. For 2,850 private college seats, a separate merit list of 18,040 candidates has been uploaded as well. The Supreme Court has ordered that the medical admission procedure in the state be completed by September 4, in its judgement dated August 22, since the procedure has already been delayed a lot. The counselling procedure will begin on August 24, 2017 and the selected students are advised to report at the medical institutes that they have been allotted. Initially, medical counselling for Tamil Nadu was supposed to begin from July 17. However, due to the state intervening in the process, first with the order of securing 85% seats for TN state board students in government medical seats and then with the demand of exemption of NEET for the year. The ordinance passed by the state government to exempt NEET was never passed by the President and after the Centre refused to budge, the Supreme Court finally ordered TN to go ahead with NEET.